The R95 bio-shredder is a hobby machine available with electric engine, with petrol engine Honda or Subaru, or in tractor version with three-point linkage. 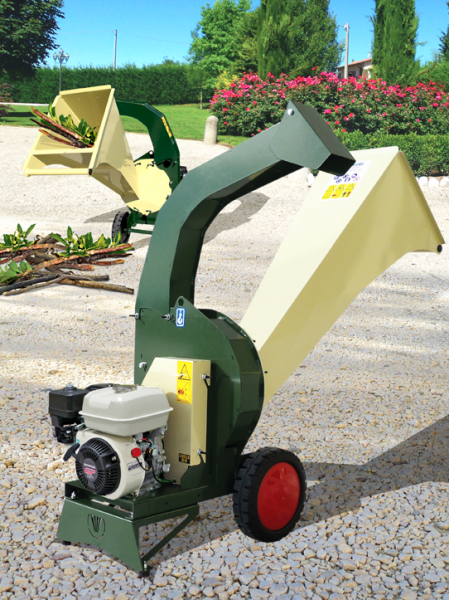 The R95 is suitable for shredding small pieces of garden waste, hedge clippings and different kinds of prunings (maximum diameter 70 mm) resulting from the maintenance of small green areas, which are introduced into one single hopper. The cutting group is formed of a front cutting blade for a first shredding and of 8 mobile hammers which refine the material further. At the end of this process, a mobile screen guarantees the fineness of the shredded material. Just the 9 hp engine version (Honda/Subaru) is equipped with a rotor with 2 blades and 8 hammers. The ejection blades at the back of the rotor create a strong suction inside the hopper, which facilitates the descent of leaves and green material and the following expulsion of the shredded material. Thanks to the 1160/1205 mm high ejection pipe with adjustable throw depth, the material can easily be discharged into a wheelbarrow or a container. The belt transmission for engine versions and the transmission with elastic joint for the tractor version make the R95 particularly safe even if big-size material is accidentally introduced. Built in a simple and sturdy way, the machine is easy to handle and to move by means of its two big wheels. At any time and at its incontestable discretion, NEGRI reserves the right to modify and improve its products, if considered necessary. This machine allows you to obtain shredded material of approximately 1 – 1,5 cm length (1) that then has to be refined, before being introduced into the P70 pellet mill (2). In order to do that, the shredded material has to be introduced into the hopper a second time, paying attention that the supplied refining screen is closed.